HAIDES (Hades) was the king of the underworld and god of the dead. This page describes his various divine roles, beginning with general descriptions of the lord of the dead, followed by sections covering his role as the god of funeral rites, necromancy, the curse of the Erinyes, dreams, and the mineral wealth of the earth. "To Plouton (Pluto) [Haides]. Plouton, magnanimous, whose realms profound are fixed beneath the firm and solid ground, in the Tartarean plains remote from sight, and wrapt for ever in the depths of night. Zeus Khthonios (of the Underworld), thy sacred ear incline, and pleased accept these sacred rites divine. Earth's keys to thee, illustrious king, belong, its secret gates unlocking, deep and strong. 'Tis thine abundant annual fruits to bear, for needy mortals are thy constant care. To thee, great king, all sovereign earth assigned, the seat of gods and basis of mankind. Thy throne is fixed in Haides' dismal plains, distant, unknown to the rest, where darkness reigns; where, destitute of breath, pale spectres dwell, in endless, dire, inexorable hell; and in dread Akheron (Acheron), whose depths obscure, earth's stable roots eternally secure. O mighty Daimon, whose decision dread, the future fate determines of the dead, with Demeter's girl [Persephone] captive, through grassy plains, drawn in a four-yoked car with loosened reins, rapt over the deep, impelled by love, you flew till Eleusinia's city rose to view: there, in a wondrous cave obscure and deep, the sacred maid secure from search you keep, the cave of Atthis, whose wide gates display an entrance to the kingdoms void of day. Of works unseen and seen thy power alone to be the great dispending source is known. All-ruling, holy God, with glory bright, thee sacred poets and their hymns delight, propitious to thy mystics' works incline, rejoicing come, for holy rites are thine." Haides was the king of the underworld and ruler of the shades of the dead. The following is a miscellaneous collection of references to the god in this role, excluding specific myths and cults. References to Haides in the Iliad and Odyssey, which mostly describe the passage of souls to the underworld, can be found on the Realm of Haides page. "Haides, pitiless in heart, who dwells under the earth." "When you go to Aides' house of wailing, down in the dark earth's depths." "Theos Khthonios (God of the Underworld) [i.e. Haides] may mean god of the lower world or sullen god." "Klytaimestra (Clytemnestra) [describes her murder of Agamemnon] : Twice I struck him, and with two groans his limbs relaxed. Once he had fallen, I dealt him yet a third stroke to grace my prayer to the infernal (khthonios) Zeus [i.e. Haides], the savior of the dead (nekrôn sôtêr). Fallen thus, he gasped away his life." "For Haides is mighty in holding mortals to account under the earth, and he observes all things and within his mind inscribes them." "A ruler of august majesty [King Agamemnon], distinguished even beneath the earth, and minister of the mightiest, the deities who rule in the nether world [Haides and Persephone]. For in your life you were a king of those who have the power to assign the portion of death [i.e. a king has the power of death over his subjects], and who wield the staff all mortals obey." "Haides, the entertainer of the dead (nekrodegmôn)." "And how can man be pure who would seize from an unwilling father an unwilling bride? For such an act, not even in Haides, after death, shall he escape arraignment for outrage. There also among the dead, so men tell, another Zeus [Haides] holds a last judgment upon misdeeds. Take heed and reply in this manner, that victory may attend your cause." "May Haides, whose portion is the earth, seize and fetter thee!" Xanthias : Phoibos Apollon! clap your hand in mine, kiss and be kissed: and prithee tell me this, tell me by Zeus, our rascaldom's own god, what's all that noise within [the house of Haides]? What means this hubbub and row? Aiakos : That's [the ghosts of the tragic poets] Aiskhylos (Aeschylus) and Euripides. Aiakos : Wonderful, wonderful things are going on. The dead are rioting, taking different sides. Xanthias : Why, what's the matter? Aiakos : There's a custom here with all the crafts, the good and noble crafts, that the chief master of art in each shall have his dinner in the assembly hall, and sit by Plouton's [Haides'] side. Aiakos : Until another comes, more wise than he in the same art: then must the first give way. Xanthias : And how has this disturbed our Aiskhylos? Aiakos : 'Twas he that occupied the tragic chair, as, in his craft, the noblest. Xanthias : Who does now? Aiakos : But when Euripides came down, he kept flourishing off before the highwaymen, thieves, burglars, parricides-these form our mob in Hades-till with listening to his twists and turns, and pleas and counterpleas, they went mad on the man, and hailed him first and wisest : elate with this, he claimed the tragic chair where Aiskhylos was seated. Xanthias : Wasn't he pelted? Aiakos : Not he: the populace clamoured out to try which of the twain was wiser in his art . . .
Xanthias : And what does Plouton now propose to do? Aiakos : He means to hold a tournament, and bring their tragedies to the proof. Xanthias : But Sophokles, how came not he to claim the tragic chair? Aiakos : Claim it? Not he! When he came down, he kissed with reverence Aiskhylos, and clasped his hand, and yielded willingly the chair to him. But now he's going, says Kleidemides, to sit third-man: and then if Aiskhylos win, he'll stay content: if not, for his art's sake, he'll fight to the death against Euripides." "[A fable told in jest :] Persephone and the mighty god Plouton [Haides] were just now threatening terrible things against all the doctors, since they keep the sick people from dying." Sokrates : Let us inquire what thought men had in giving them [the gods] their names . . . The first men who gave names [to the gods] were no ordinary persons, but high thinkers and great talkers . . . Let us, then, speak of his [Zeus] brothers, Poseidon and Plouton (Pluto) [Haides], including also the other name of the latter . . . Plouton, he was so named as the giver of wealth (ploutos), because wealth comes up from below out of the earth. And Haides--I fancy most people think that this is a name of the Invisible (aeidês), so they are afraid and call him Plouton. I think people have many false notions about the power of this god, and are unduly afraid of him. They are afraid because when we are once dead we remain in his realm for ever, and they are also terrified because the soul goes to him without the covering of the body. But I think all these facts, and the office and the name of the god, point in the same direction . . . Please answer this question : Which is the stronger bond upon any living being to keep him in any one place, desire, or compulsion? Hermogenes : Desire, Sokrates, is much stronger. Sokrates : Then do you not believe there would be many fugitives from Haides, if he did not bind with the strongest bond those who go to him there? . . . Apparently, then, if he binds them with the strongest bond, he binds them by some kind of desire, not by compulsion . . . There are many desires, are there not? . . . Then he binds with the desire which is the strongest of all, if he is to restrain them with the strongest bond ... And is there any desire stronger than the thought of being made a better man by association with some one? . . . Then, Hermogenes, we must believe that this is the reason why no one has been willing to come away from that other world, not even the Seirenes (Sirens), but they and all others have been overcome by his enchantments, so beautiful, as it appears, are the words which Haides has the power to speak; and from this point of view this god is a perfect sophist and a great benefactor of those in his realm, he who also bestows such great blessings upon us who are on earth; such abundance surrounds him there below, and for this reason he is called Plouton. Then, too, he refuses to consort with men while they have bodies, but only accepts their society when the soul is pure of all the evils and desires of the body. Do you not think this shows him to be a philosopher and to understand perfectly that under these conditions he could restrain them by binding them with the desire of virtue, but that so long as they are infected with the unrest and madness of the body, not even his father Kronos could hold them to himself, though he bound them with his famous chains? . . . And the name 'Haides' is not in the least derived from the invisible (aeides), but far more probably from knowing (eidenai) all noble things, and for that reason he was called Haides by the lawgiver." "This is the reason why Haides, who is wise, consorts with her [Persephone], because she is wise." "Haides, snatcher of all things, shall lay his hand [upon you]." "[Persephone] the spouse of Klymenos [Haides], host of many (polyzeinos)." "[Amongst the scenes depicted on a table by Kolotes dedicated in the temple of Hera at Olympia :] Plouton [Haides] holds a key, they say that what is called Haides has been locked up by Plouton, and that nobody will return back again there from." "O mighty Daimon [Haides], whose decision dread, the future fate determines of the dead, with Demeter's girl [Persephone]." "Earth everywhere splits deep [when Phaethon scorches the earth] and light strikes down into Tartara (the Underworld) and fills with fear Rex Infernus (Hell's monarch) [Haides] and his consort [Persephone]." "The land [of Sicily] quakes [as Typhoeus the Giant buried beneath it tries to escape] and even the king who rules the land of silence (Rex Silentum) [Haides] shudders lest the ground in gaping seams should open and the day stream down and terrify the trembling Shades (Umpire). The tyrant (Tyrannus) had left his dark domains to and fro, drawn in his chariot and sable steeds, inspected the foundations of the isle." "I [Herakles] have seen places unapproached by any . . . those gloomy spaces which the baser pole hath yielded to infernal Jove [Haides]; and if the regions of the third estate pleased me, I might have reigned." "All the world's holy powers, and thou [Haides] who rulest the all-holding realm, and thou [Persephone] whom, stolen from Enna, thy mother [Demeter] sought in vain, may it be right, I pray, boldly to speak of powers hidden away and buried beneath the earth." "What of him who holds sway over the dark realm? Where sits he, governing his flitting tribes? . . . A plain lies round about this where sits the god [Haides], where with haughty mien his awful majesty assorts the new-arriving souls. Lowering is his brow, yet such as wears the aspect of his brothers and his high race; his countenance is that of Jove, but Jove the thunderer; chief part of that realm's grimness is its own lord, whose aspect whate'er is dreaded dreads." "The overlord [Haides] of the fast-holding realm and of the silent Styx has made no way to the upper world once quitted." "Taenarus and the cruel tyrant's [Haides] kingdom and Cerberus, guarding the portal of no easy passage." "Himself [Pluto-Haides] I behold, all pale upon the throne, with Stygian Eumenides [Erinyes] ministering to his fell deeds about him, and the remorseless chambers and gloomy couch of Stygian Juno [Proserpina-Persephone]. Black Mors (Death) [Thanatos] sits upon an eminence, and numbers the silent peoples for their lord; yet the greater part of the troop remains. The Gortynian judge [Minos] shakes them [the ghosts of the dead] in his inexorable urn, demanding the truth with threats, and constrains them to speak out their whole lives' story and at last confess their extorted gains." As he threatens, the other draws nigh, on foot now and shadowy to view, his armour growing faint, yet in his lifeless face abides the dignity of augurship inviolate, and on his brow remains the fillet dim to behold, and in his hand is a branch of dying olive. ‘If it be lawful and right for holy Manes (Shades) to make utterence here, O thou to all men the great Finisher, but to me, who once knew causes and beginnings, Creator also! remit, I pray, thy threatenings and thy fevered heart, nor deem worthy of thy wrath one who is but a man and fears thy laws; 'tis for no Herculean plunder--such wars are not for me--, nor for a forbidden bride--believe these emblems--that I dare to enter Lethe : let not Cerberus flee into his cave, nor Proserpine [Persephone] shudder at my chariot. I, once the best beloved of augurs at Apollo's shrines, call empty Chaos to bear witness--for what power to receive an oath has Apollo here?--for no crime do I suffer this unwonted fate, nor have I deserved to be thus torn from the kindly light of day; the urn of the Dictean judge doth know it, and Minos can discern the truth. Sold by the treachery of my wife [Eriphyle] for wicked gold, I joined the Argive host, not unwitting--hence this crowd of new-slain ghosts thou seest, and the victims also of this right hand; in a sudden convulsion of the earth--my mind still shrinks in horror--thy darkness swallowed me up from the midst of thousands . . . content am I to receive my Shade [i.e. Amphiaraus was not yet dead for he was dropped alive into Haides], nor remember my tripods any more. For what avails thee the use of prescient augury, when the Parcae [Moirai, fates] spin thy commands? Nay, be thou softened, and prove more merciful than the gods. If ever my accursed wife come hither, reserve for her thy deadly torments : she is more worthy of thy wrath, O righteous lord!’ He [Haides] accepts his prayer, and is indignant that he yields." "Thrice from the regions of doom thundered their [the Erinyes'] impatient monarch [Haides], and shook the depths of the earth [at the commencement of the War of Thebes] . . . The king of Tartarus [Haides] himself orders the gates to be set open [i.e. to receive the legions of the slain]." "The Warden of the Larvae (Shades) [lord Haides] and the third heir of the world, after the lot's unkind apportioning, leapt down from his chariot and grew pale, for he was come to Tartarus and heaven was lost for ever." "Let him [the shade of a father] come, and approach the awful throne of the silent monarch [Haides] and pay his last due of gratitude and anxiously request for his son a long life." "Celaeneus (the Black) [Pluto-Haides], sitting sable-shrouded and sword in hand, cleanses the innocent from their error." "I was pulled out of the hands of Orcus [Haides] [i.e. saved from death]." "And Haides shuddered [at the slaughter of the Sack of Troy] and looked forth from his seat under earth, afraid lest in the great anger of Zeus Hermes, conductor of souls, should bring down all the race of men." "[Poseidon and Apollon battle as the gods take sides in the war of Dionysos against the Indians :] Then Zeus Khthonios (Zeus of the Underworld) [Haides] rumbled hearing the noise of the heavenly fray above; he feared that the Earthshaker [Poseidon], beating and lashing the solid ground with the earthquake-shock of his waves, might lever out of gear the whole universe with his trident, might move the foundations of the abysm below and show the forbidden sight of earth's bottom, might burst all the veins of the subterranean channels and pour his water away into the pit of Tartaros, to flood the mouldering gates of the lower world. So great was the din of the gods in conflict, and the trumpets of the underworld added their noise." "[During the war of Dionysos against the Indians :] Lethe was choked with that great multitude of corpses brought low and scattered on every side. Aides heaved up his bar in the darkness, and opened his gates wider for the common carnage; as they descended into the pit the banks of Kharon's river echoed the rumblings of Tartaros." "[Dionysos transforms his dead friend Ampelos into a grape vine :] ‘For you Haides himself has become merciful, for you Persephone herself has changed her hard temper, and saved you alive in death for brother Bakkhos (Bacchus). You did not die . . . You are still alive, my boy, even if you died.’"
Haides was god of funeral rites and mourning. Those who did not receive the proper burial rites were refused entry to the underworld. "Mourning and wailing are the portion of Hades." "Cry out the awful hymn of the Erinys [i.e. the shrieks and cries of the grieving women] and thereafter sing the hated victory song of Aides [i.e. the funeral dirge]." "Of Haides it is said that he laid down the rules which are concerned with burials and funerals and the honours which are paid to the dead, no concern having been given to the dead before this time; and this is why tradition tells us that Haides is lord of the dead, since there were assigned to him in ancient times the first offices in such matters and the concern for them." "The father of the Eumenides [i.e. Haides, father of the Erinyes,] and the ferryman of Lethe's stream [Kharon (Charon)] debars them [i.e. the souls of the unburied] from the Stygian gate and keeps them hovering doubtfully between the worlds of heaven and hell (Erebus)." Haides was invoked and propitiated in the rites of necromancy (nekromankia)--the summoning of ghosts of the dead. He and Persephone also presided over the oracles of the dead (nekromanteia), such as the necromantic shrines of Thesprotia and Kume (Cumae). 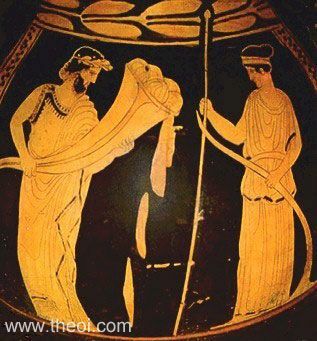 Odysseus was instructed in the rites of necromancy by the witch Kirke (Circe) so that he might commune with the ghost of the seer Teiresias. According to the author of the Odyssey the rites were performed at the border of the underworld. Later authors, however, say that Odysseus visited the Nekromanteion (Oracle of the Dead) at Cumae in southern Italy. "[Kirke (Circe) instructs Odysseus in the rites of necromancy :] ‘You must visit the house of dread Persephone and of Haides, and there seek counsel from the spirit of Theban Teiresias (Tiresias). The blind seer's thought is wakeful still, for to him alone, even after death, Persephone has accorded wisdom; the other dead are but flitting shadows . . .
‘And when you have sailed through the river Okeanos (Oceanus), you will see before you a marrow strand and he groves that are Persephone's--the tall black poplars, the willows with their self-wasted fruit; then beach the vessel beside deep-eddying Okeanos and pass on foot to the dank domains of Haides. At the entrance there, the stream of Akheron (Acheron) is joined by the waters of Pyriphlegethon and a branch of Styx, Kokytos (Cocytus), and there is a rock where the two loud-roaring rivers meet. Then, lord Odysseus, you must do as I enjoin you; go forward, and dig a trench a cubit long and a cubit broad; go round this trench, pouring libation for all the dead, first with milk and honey, then with sweet wine, then with water; and sprinkle white barley-meal above. Then with earnest prayers to the strengthless presences of the dead you must promise that when you have come to Ithaka you will sacrifice in your palace a calfless heifer, the best you have, and will load a pyre with precious things; and that for Teiresias and no other you will slay, apart, a ram that is black all over, the choicest in all the flocks of Ithaka. ‘When with these prayers you have made appeal to the noble nations of the dead, then you must sacrifice a ram and a black ewe; bend the victims' heads down towards Erebos, but turn your own head away and look towards the waters of the river. At this, the souls of the dead and gone will come flocking there. With commanding voice you must call your cmorades to flay and burn the two sheep that now lie before them, killed by your own ruthless blade, and over them to pray to the gods, to resistless Haides and dread Persephone. As for yourself, draw the keen sword from beside your thight; then, sitting down, hold back the strengthles presences of the dead from drawing nearer to the blood until you have questioned Teiresias. Then, King Odysseus, the seer will come to you very quickly, to prophesy the path before you, the long stages of your travel, and how you will reach home at last over the teeming sea.’"
"[Odysseus journeys to the underworld to consult the ghost of the seer Teiresias :] The vessel came to the bounds of eddying Okeanos (Oceanus), where lie the land and city of the Kimmeroi (Cimmerians), covered with mist and cloud. never does the resplendent sun look on this people with his beams . . . dismal gloom overhangs these wretches always. Arriving there, we beached the vessel, took out the sheep and then walked onwards beside the stream of Okeanos until we came to the place that Kirke (Circe) had told us of. There, Perimedes and Eurylokhos (Eurylochus) seized the victims and held them fast, while I myself drew the keen sword from besie my thigh and cut a trench a cubit long and a cubit broad. Round it I poured a libation for all the dead, first with milk and honey, then with sweet wine, then with water; over this I sprinkled white barley-meal. Then with earnest prayers to the strengthless presences of the dead I promised that when I came to Ithaka I would sacrifice in my palace a calfless heifer, the best I had, and would load a pyre with precious things; and that for Teiresias and no other I would slay, apart, a ram that was black all over, the choicest in all the flocks of Ithaka. When with my prayers and invocations I had called on the peoples of the dead, I seized the victims and cut their throats over the trench. The dark blood flowed, and the souls od the dead and gone came flocking upwards from Erebos--brides and unmarried youths, old men who had suffered much, tender girls with the heart's distress still keen, troops of warriors wounded with brazen-pointed spears, men slain in battle with blood-stained armour still upon them. With unearthly cries, from every quarter, they came crowding about the trench until pale terror began to master me. Then with urgent voice I called my comrades to flay and burn the two sheep that now lay before them, killed by my own ruthless blade, and over them to pray to the gods, to resistless Haides and dread Persephone. As for myself, I drew the keen sword from beside my thigh, seated myself and held back the strengthless preseences of the dead from drawing nearer to the blood before I had questioned Teiresias." Meanwhile there appeared a whole company of women [before Odysseus], sent by Persephone the august; and these were the wives or the daughters of great men. They gathered flocking round the dark blood [of the sacrificed black sheep] all together. So they came forward one after another, and each in turn told me her lineage, for I left none of them unquestioned . . . Then, when chaste Persephone had dispersed this way and that the souls of those many women, there came before me in bitter sorrow the soul of Agamemon . . . Then there came before me the soulds of Akhilleus (Achilles) and Patroklos (Patroclus), of noble Antilokhos (Antilochus) and of Aias (Ajax) . . . The soul of the fleet-foot son of Peleus went pacing forth over the field of asphodel . . . Other souls of the dead and gone still stood there sorrowfully, each of them questioning me on whatever touched them the most . . . Indeed I might then have seen [more of] those men of past days I wished to see, but before I could, there came before me with hideous clamour the thronging multitudes of the dead, and ashly terror seized hold of me. I feared that august Persephone might send against me from Haides' house the Gorgoneion (the gorgon's head) of some grisly monster. I made for my ship at once, telling my comrades to step aboard and to loose the cables." "He [Odysseus] sailed Okeanos (Oceanus), and offered sacrifices to the souls, and by Kirke's (Circe's) advice consulted the soothsayer Tiresias, and beheld the souls both of heroes and of heroines. He also looked on his mother Antikleia and Elpenor, who had died of a fall in the house of Kirke . 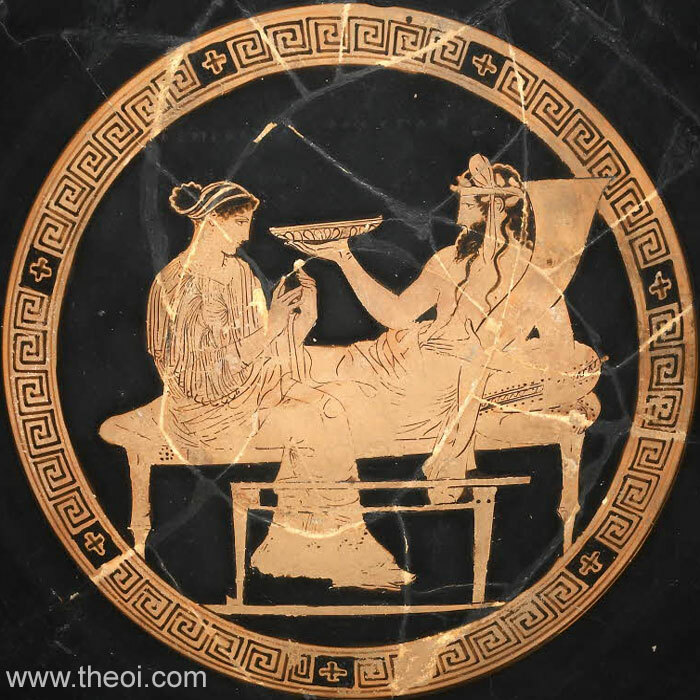 . .
[Upon returning to Ithaka, Odysseus slew the suitors and then :] After sacrificing to Haides, and Persephone, and Teiresias, he journeyed on foot through Epiros (Epirus), and came to the Thesprotians, and having offered sacrifice according to the directions of the soothsayer Teiresias, he propitiated Poseidon." "The grove of Obrimo [i.e. the grove of Persephone near Avernos in Italy], Kore (Core, Maiden) who dwells beneath the earth, and Pyriphleges (the Fiery Stream), where the difficult Polydegmon hill [in Italy] stretches its head to the sky . . . and the lake Aornos [i.e. lake Avernus near Cumae] rounded with a noose and the waters of Kokytos wild and dark, stream of black Styx . . . he [Odysseus] shall offer up a gift to Daeira [Persephone] and her consort, fastening his helmet to the head of a pillar." In Statius' Thebaid the seer Teiresias (Tiresias) performs necromancy to commune with the dead for King Oidipous would learn the cause of the plague inflicting Thebes. "[The seer Tiresias declares that he will perform necromancy :] ‘We must unseal the earth, must implore the implacable divinity of Dis [Haides], must draw forth hither the people [ghosts] of infernal Styx.’"
"He [the seer Tiresias] prepares the rites of Lethe [i.e. nekromankia], and makes ready beforehand to evoke the monarch [Pluto-Haides] sunk below the confines of [the river] Ismenos where it mingles with the deep, and makes purgation all around with the torn entrails of sheep and the strong smell of sulphur, and with fresh herbs and the long mutterings of prayer . . . [Tiresias] bids the dark-fleeced sheep and black oxen be set before him . . . Then he entwined their fierce horns with wreaths of dusky hue, handling them himself, and first at the edge of that well-known wood [i.e. one sacred to the goddess Hekate] he nine times spills the lavish draughts of Bacchus into a hollowed trench, and gifts of vernal milk and Attic rain [i.e. honey] and propitiatory blood to the Shades below; so much is poured out as the dry earth will drink. Then they roll tree trunks thither, and the sad priest bids there be three altar-fires for Hecate and three for the maidens born of cursed Acheron [the Erinyes]; for thee, lord of Avernus [Pluto-Haides], a heap of pinewood though sunk into the ground yet towers high into the air; next to this an altar of lesser bulk is raised to Ceres of the Underworld [Proserpina-Persephone]; in front and on every side the cypress of lamentation intertwines them. And now, their lofty heads marked with the sword and the pure sprinkled meal, the cattle fell under the stroke; then the virgin Manto [daughter of Tiresias], catching the blood in bowls, makes first libation, and moving thrice round all the pyres, as her holy sire commands, offers the half-dead tissues and yet living entrails, nor delays to set the devouring fire to the dark foliage. And when Tiresias heard the branches crackling in the flames and the grim piles roaring--for the burning heat surges before his face, and the fiery vapour fills the hollows of his eyes--he exclaimed, and the pyres trembled, and the flames cowered at his voice : ‘Abodes of Tartarus and awful realm of insatiable Mors (Death) [Thanatos], and thou, most cruel of the brothers [Pluto-Haides], to whom the Shades are given to serve thee, and the eternal punishments of the damned obey thee, and the palace of the underworld, throw open in answer to my knowing the silent places and empty void of stern Persephone, and send forth the multitude that lurk in hollow night.’"
"[The blind Tiresias describes the visions he receives as he performs necromancy :] ‘Himself [Pluto-Haides] I behold, all pale upon the throne, with Stygian Eumenides [Erinyes] ministering to his fell deeds about him, and the remorseless chambers and gloomy couch of Stygian Juno [Proserpina-Persephone].’"
Aeson and his wife, the witch Alkimede (Alcimede), perform necromancy to learn the fate of their son Jason and to bring down a curse upon King Pelias who plots their death. Then he appeased the goddess of triple form [i.e. Hecate, goddess of earth-bound ghosts], and with his last sacrifice offers a prayer to the Stygian abodes, rehearsing backward a spell soon, soon to prove persuasive; for without that no thin shade will the dark ferryman [Kharon] take away, and bound they stand at the mouth of Orcus [Haides]." Witches such as Medea were also practitioners of necromancy. Medea employs these powers in a spell to restore Aeson's youth. "[Medea uses her magic to restore Aeson's youth :] Two turf altars she built [for the ritual], the right to Hecate, the left to Juventas (Youth) [Hebe], wreathed with the forest's mystic foliage, and dug two trenches in the ground beside and then performed her rites. Plunging a knife into a black sheep's throat she drenched the wide ditches with blood; next from a chalice poured a stream of wine and from a second chalice warm frothing milk and, chanting magic words, summoned the Deities of Earth (Numina Terrena) and prayed the sad shades' monarch (Rex Umbrarum) [Pluto-Haides] and his stolen bride [Proserpina-Persephone] that, of their mercy, from old Aeson's frame they will not haste to steal the breath of life . . . [and she then applied her potions to the body of the man.] And Aeson woke and marvelled as he saw his prime restored of forty years before." Witches in general were regarded as practitioners of the necromancy. "The gloomy councils of the Shades complain [at being summoned from Haides by a witch], and black Avernus' sire [lord Pluto-Haides] waxes indignant." The Oracles of the Dead (Nektromanteion) in Thesprotia and Kyme (Cumae) were shrines dedicated to the gods Haides and Persephone. The oracles of the daimones Amphiaraus and Trophonios in Boiotia were also necromantic in nature. Haides was the god of the most potent curses, those which invoked the fury of the Erinyes. The god was sometimes described despatching an angry ghost from the underworld accompanied by an Erinys to avenge a crime, especially patricide or matricide. "[The ghost of the murdered king Agamemnon is invoked :] This has pierced the earth and reached your [the ghost's] ear as if it were an arrow. O Zeus, O Zeus [i.e. Haides, the Zeus of the underworld], who send long-deferred retribution up from below [i.e. in the form of the Erinyes] onto the reckless and wicked deeds done by the hands of mortals." "Begin, [Erinyes] handmaids of Dis [Haides], make haste to brandish the burning pine." "We [the souls of the dead] are not dissolved into the breezes or into mere bones at the last: anger abides and grief endures. Thereafter when they are come to the throne of Awful Jove [Pluto-Haides] and have set forth all the sorrowful story of their dreadful end, the gate of death is opened for them and they may return a second time [i.e. to the earth as vengeful ghosts]; one of the Sisters [i.e. the Erinyes] is given them as a companion, and they range together over lands and seas. Each involved in penalties the guilty souls of his own foes; they rack them with various terrors after their deserving. But those whose hands have dripped with blood unwillingly--or were it cruel mischance, though nigh to guilt, that swept away the wretches--these men their own minds harry in divers ways, and their own deeds vex the doers; languid now and ventureless they decline into tears and spiritless alarms and sickly sloth [i.e. in their grief at having accidentally killed someone]: such thou dost here behold . . .
Celaeneus (the Black) [Pluto-Haides], sitting sable-shrouded and sword in hand, cleanses the innocent from their error, and remitting their fault unwinds a spell to appease the angry Shades. He it was who taught me [the seer Mopsos] what lustrations should be made to the slain, he of his good pleasure opened the earth to Erebus below. When therefore the orient sets the crimson seas aflame, do thou summon thy comrades to sacrifice, and bring two steers to the mighty gods; for me were it wrong meanwhile to approach your gathering, until I spend the night in cleansing prayers [i.e. in preparation for the ceremony of purification to cleanse a man of the crime of murder and drive away the Erinyes and the avenging ghost of the dead]." "[Pluto-Haides commands the Erinys :] ‘Go, Tisiphone, avenge the abode of Tartarus! if ever thou hast wrought monsters fierce and strange, bring forth some ghastly horror, huge and unwonted, such as the sky hath never yet beheld, such as I may marvel at and thy Sisters [Moirai] envy.’"
"At their [ghosts of the men slain by the wrestler Ampycus] entreaty father Tartarus [Haides] sends forth in a hollow cloud the Shades of the slain to view at last the well-earned retribution [Ampycus' own death]; the mountain-tops grow black with them." "The king of Tartarus [Haides] himself orders the gates to be set open [ready to receive the legions of newly dead from war], and the Ogygian Manes (Ghosts) to attend their kindred's monstrous deeds [in the internecine War of the Seven Against Thebes]. Seated upon their native hills they pollute the day with grisly band, and rejoice that their own crimes should be surpassed." "[Phoinix tells the tale of his father's curse :] ‘I [Phoinix] first left Hellas . . . running from the hatred of Ormenos' son Amyntor, my father; who hated me for the sake of a fair-haired mistress. For he made love to her himself, and dishonoured his own wife, my mother; who was forever taking my knees and entreating me to lie with this mistress instead so that she would hate the old man. I was persuaded and did it; and my father when he heard of it straightway called down his curses, and invoked against me the dreaded Erinyes that I might never have any son born of my seed to dandle on my knees; and the divinities, Zeus Khthonios (of the Underworld) [i.e. Haides] and Persephone the honoured goddess, accomplished his curses.’"
"Meleagros (Meleager) lay mulling his heart-sore anger, raging by reason of his mother's [Althaia's] curses, which she called down from the gods upon him, in deep grief for the death of her brother, and many times beating with her hands on the earth abundant she called on Haides and on honoured Persephone, lying at length along the ground, and the tears were wet on her bosom, to give death to her son; and Erinys, the mist-walking, she of the heart without pity, heard her out of the dark places." [Medea replies :] ‘Sister you left me speechless when you talked of curses and avenging Erinyes (Furies).’"
"[The witch Medea] wearies heaven above and Tartarus beneath with her complaints [about her love for Jason]; she beats upon the ground, and murmuring into her clutching hands calls on the Queen of Night [Hecate] and Dis [Haides] to bring her aid by granting death, and to send him who is the cause of her madness down with her to destruction." "[Oidipous (Oedipus) blinds himself when he learns he has killed his father and married his mother. His sons afterwards treat him with cruel disdain and so he calls upon the Erinyes to punish them :] Oedipus with avenging hand probed deep his sinning eyes and sunk his guilty shame in eternal night . . . yet with unwearied wings the fierce daylight of the mind hovers around him, and the avenging Dirae [Erinyes] of his crimes assail his heart. Then he displays to heaven those empty orbs, the cruel, pitiful punishment of his own lie, and with blood-stained hands beats upon the hollow earth, and in dire accents utters this prayer : ‘Gods [Pluto-Haides, Persephone and the Erinyes] who hold sway over guilty souls and over Tartarus crowded with the damned, and thou O Styx, whom I behold, ghastly in thy shadowy depths, and thou Tisiphone, so oft the object of my prayer, be favourable now, and further my unnatural wish . . . Sightless though I was and driven from my throne, my sons, on whatever couch begotten, attempted not to give me guidance or consolation in my grief . . . and they mock my blindness, they abhor their father's groans . . . Do thou at least, my due defender, come hither, and begin a work of vengeance that will blast their seed for ever!’"
"Persephone : An Underworld spirit (katageios daimon). Elektra says : ‘O house of Haides and Persephone! O Hermes of the Underworld and holy Ara (Curse) and divine Erinnyes (Furies)! You who watch over those dying unjustly and those being robbed of a marriage bed: Come! Help avenge the murder of our father!’"
Haides was invoked in binding oaths with the connotation "let me be cursed if I dare to break the oath." "[King Phineos swears an oath to the Argonauts :] ‘By the Powers below [i.e. Haides, Persephone and the Erinyes]--and may they blast me if I die forsworn--that you will not incur the wrath of Heaven by helping me.’"
"[King Oedipus swears an oath :] ‘Now at Heaven's command let the crime be expiated [i.e. the murder of king Laius]. Whoever of the gods dost look with favour upon kingdoms--thou [Jupiter-Zeus], thou whose are the laws of the swift-revolving heavens; and thou [Sol-Helios the Sun], greatest glory of the unclouded sky . . . and thou, his sister [Luna-Selene the Moon] . . . thou [Neptune-Poseidon] whom the winds obey . . . and thou [Pluto-Haides] who dost allot homes devoid of light--do ye all attend : Him by whose hand Laïus fell may no peaceful dwelling, no friendly household gods, no hospitable land in exile entertain.’"
"[Oedipus curses himself upon discovering he has killed his father and married his mother :] ‘Yawn, earth! And do thou [Pluto-Haides], king of the dark world, ruler of shades, to lowest Tartarus hurl this unnatural interchange ‘twixt brood and stock.’"
Haides was the master of dreams in particular those believed to have been sent by the ghosts of the dead. The two-doored gate of dreams--one false, the other true--was located in Haides' realm. "So did these ghosts travel on together squeaking, while easeful Hermes led them down through the ways of dankness. They passed the streams of Okeanos (Oceanus), the White Rock, the Gates of the Sun and the Land of Dreams, and soon they came to the field of asphodel, where the souls, the phantoms of the dead have their habitation." "Plouton (Pluto) [Haides], master of the black-winged Oneiroi (Dreams)." "The Grypes (Griffins), and the one-eyed (monôpoi) Arimaspoi (Arimaspians), mounted on horses, who dwell about the flood of Plouton's [i.e. Haides, as god of wealth's] stream that flows with gold." "The bowels of the world were forced [by men] and wealth deep hidden next the Umbrae Stygiae (Ghosts of Hell) dug out, the spur of wickedness and sin." "The entire bulk and substance of the earth, was dedicated to father Dis [Haides] (that is, Dives, ‘the rich’, and so in Greek Plouton), because all things fall back into the earth and also arise from the earth." "The miner returns all pale at the sight of Dis [Haides] and yellow as the gold he has unearthed." Haides was the god of the fertile earth who released Persephone--a goddess symbolising the sprouting of shoots of grain--from his subterranean realm in spring. He was often depicted holding a cornucopia bursting with sheafs of grain. "Pray to Zeus Khthonios (of the Earth) [Haides] and to pure Demeter to make Demeter's holy grain sound and heavy, when first you begin ploughing, when you hold in your hand the end of the plough-tail and bring down your stick on the backs of the oxen as they draw on the pole-bar by the yoke-straps." Sokrates : Let us inquire what thought men had in giving them [the gods] their names . . . The first men who gave names [to the gods] were no ordinary persons, but high thinkers and great talkers . . . Plouton [Haides], he was so named as the giver of wealth (ploutos), because wealth comes up from below out of the earth . . . [and] he also bestows such great blessings upon us who are on earth; such abundance surrounds him there below, and for this reason he is called Plouton." "Zeus Khthonios (of the Underworld) [i.e. Haides], thy sacred ear incline, and pleased accept these sacred rites divine. Earth's keys to thee, illustrious king, belong, its secret gates unlocking, deep and strong. 'Tis thine abundant annual fruits to bear, for needy mortals are thy constant care. To thee, great king, all sovereign earth assigned, the seat of gods and basis of mankind." "The entire bulk and substance of the earth, was dedicated to father Dis [Haides] (that is, Dives, ‘the rich’, and so in Greek Plouton), because all things fall back into the earth and also arise from the earth. He is said to have married Proserpina (really a Greek name, for she is the same as the goddess called Persephone in Greek)--they think that she represents the seed of corn, and fable that she was hidden away, and sought for by her mother. The mother is Ceres [Demeter]."